Double-acting centring clamp with two clamping points. All components from high-grade hardened and nitrided steel. Oil supply via oil channel in fixture body. 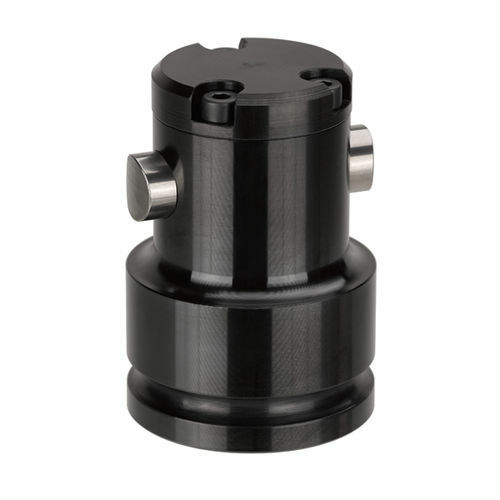 For centring and clamping workpieces with machined or cast holes, cutouts or penetrations. Element screwed directly onto the fixture body, sealed with O-ring. The centring clamp is fastened from below; oil is supplied through drilled channels in the fixture body. If the centring clamp is fastened from above and oil supplied through conduits drilled in the fixture body, a connection plate for O-ring connection is needed. 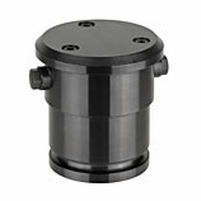 If the centring clamp is fastened from above and oil supplied through pipes, a connection plate for pipe connection is needed. The practical combination of 2-point and 3-point elements can avoid over-determined clamping states. Unsuitable for use on lathes.